What is your experience of commuting to Cranfield campus? 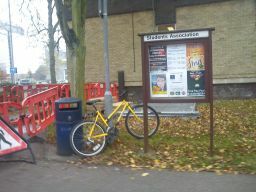 What do you think about public transport serving the university and facilities for walkers and cyclists? Have your say! Message from the new Environment and Energy Team:”The University is currently developing a Travel Plan and wants to hear about your experiences travelling to and from campus. The Plan will support our commitment to carbon reduction by exploring the ways travel choices can be improved on campus, including pedestrian and cycle access; rail and car travel; bus services and business travel. You are invited to complete a short survey to put forward your thoughts and comments on the travel issues that affect you. This feedback will then be used in scoping the Travel Plan and in lobbying local planners to improve travel choices where appropriate”.